Looking to buy Bitcoins and don’t know where to start? You’ve come to the right place, this guide is for you. I wrote it with a “noob mentality” in mind. That’s it! The Bitcoins will be sent to your wallet within a matter of minutes. How many bitcoins would you like to buy? 1. Introduction – Who is this guide for? Even though Bitcoin has been around since 2009, it still seems to be too technical and complicated for the average Joe on the street. For the past five years, I’ve been getting two types of letters. The first type are letters from people asking about the safest place to buy bitcoins. Since there are so many options available, it seems like people get into some sort of “analysis paralysis” and decide to abandon their decision to buy Bitcoin after doing some initial research. The second type are letters from people who got scammed or had their bitcoins stolen or lost. Since Bitcoin is relatively new to the Internet, many (mean) people take advantage of the lack of knowledge of this amazing currency in order to fool others out of their money. In order to try and help the growing Bitcoin community as much as possible, I decided to write the definitive beginner’s guide to buying bitcoins. I’m going to teach you how to fish, instead of giving you a fish…so to speak. I will teach you the basics, which will be applicable to any Bitcoin transaction you’ll ever make. This way you will be able to make the wisest decision possible the next time you come to purchase bitcoins. First of all, I suggest you bookmark this guide. It’s not a short read, and you may want to refer to it later on. Each chapter is a standalone mini-guide that can be read in separately, but I advise you to read the whole thing through so that everything will make sense. The first step we’re going to want to do before even buying any amount of Bitcoins is to obtain a Bitcoin wallet. Bitcoins need to be stored inside a Bitcoin wallet. So when you buy them from an exchange, it’s highly recommended (super highly recommended) that you move them from the exchange into your own personal wallet. If you fail to do so, you are at risk that someone may hack the exchange—or even that the exchange will close up shop and you won’t be able to get your money out (hey, it happened before). There are more than 20 types of known Bitcoin wallets you can use, and it can get a bit overwhelming trying to compare all of these Bitcoin wallets. But that’s what this guide is for, isn’t it? Let’s take a look at the options you have at hand. An independent wallet means that you are the sole owner of your bitcoins and that you are not putting your Bitcoins in the hands of a third party. There are many types of independent wallets. For example, the first Bitcoin wallet ever to be produced was the Bitcoin Core wallet. Even though using an independent wallet is considered to be more secure, it also means that you are the only one responsible for your coins’ security, so you need to take the appropriate measures (keep reading—we’ll get to that as well). Another thing to take into account is that independent wallets are usually harder to set up than third-party wallets. Also, if you lose your wallet, you lose your coins. No one will be able to get them back to you (ask this poor fellow). Like their name suggests, third-party wallets are controlled by someone other than you. This will usually be some sort of company or exchange (e.g., Coinbase, Xapo). Using these types of wallets is usually easier because they are more geared toward beginners, but you’re also putting the fate of your coins into the hands of someone else. That’s why it’s important to only use trusted third-party wallet providers. The good thing about these wallets is that you can usually access them from anywhere you are on the web, and they aren’t connected to one specific physical device. However, the company that is supplying you with the wallet has some amount of control over your bitcoins (the amount of control varies depending on the wallet). Also, since they are accessible through the web, they are more prone to being hacked. Most third-party wallet companies today take sufficient security measures in order to ensure that no one hacks your account. One of these measures is called Two-Factor Authentication (or 2FA for short). Using 2FA helps the wallet verify your identity by asking you to enter not only your username and password but also enter an access code that is sent to a different device than the one you’re using to log on. For example, when you log in to Coinbase, you’ll be asked to enter a code which will be sent to you via text message. A multi-user wallet (also known as a multisig wallet) is a wallet that has more than one owner, and the coins inside that wallet can only be accessed if a preset number of owners agree to it. For example, let’s say a company opened a multisig wallet with three owners: the CEO and two other managers. They set the rules for this specific wallet so that it takes at least two owners to authorize a transaction. If the CEO wants to send bitcoins to someone from this wallet, he or she needs to get at least one other manager on board. Multisig wallets are considered more secure because even if one of the keys to the wallet is stolen, there’s still no way to drain the wallet’s funds without the other owners. A good way to use a multisig wallet would be to give two keys to yourself and one to a third party so that if one key gets stolen, your bitcoins are still safe and accessible. Copay is an example of a multisig wallet. Bitcoins can also be stored on all types of physical items, such as flash drives, dedicated Bitcoin hardware wallets (e.g., TREZOR or Ledger), and even on actual paper. A Bitcoin wallet is a set of letters and numbers, like a secret code to access your Bitcoins—also known as a private key. If you write that “code” down on paper, you can create what is known as a “paper wallet.” If you want to dive deeper into this subject, take a look here. Hardware wallets are devices that can be connected to your computer and hold your private key for you. They are considered to be ultrasecure since they are not connected to the Internet and can even be run safely on a compromised computer. Hardware wallets and paper wallets are actually a subset of independent wallets. They present the best form of security and control you can have over your Bitcoins. To sum things up, Bitcoin wallets boil down to who has power over your Bitcoins: you alone (software and physical wallets), you and another company (web wallets), or you and the other owners of the wallet (multisig wallets). How often are you planning on sending out bitcoins? Notice that I ask only about sending bitcoins, as receiving bitcoins is pretty much the same for all types of wallets. If you think you’re going to be a heavy Bitcoin user, I suggest using a wallet that is easily accessible on your mobile phone so that it will always be available. However, if you’re buying Bitcoin as a long-term investment, I suggest using a hardware or paper wallet, as it’s the most secure option. How many Bitcoins do you plan on owning? If you’re just going to buy a small amount of bitcoins, then it doesn’t really matter which wallet you use since the risk isn’t that big. However, if you’re planning to spend a considerable amount of money on your newly purchased bitcoins, you may want to consider using a multisig wallet or a hardware wallet, both of which are considered to be safer in general. How easy is it to access the wallet, send bitcoins, and receive funds? Some wallets have a great user interface, while others tend to lag behind with interfaces that will scare any new Bitcoiner away. How paranoid are you about someone stealing your bitcoins? How concerned are you about your anonymity? The answers, of course, will vary from one person to the other, but many in the Bitcoin ecosystem don’t trust anyone but themselves. This type of user would probably prefer independent wallets over third-party ones. More than that, certain third-party wallets require you to sign up with your name and email, thus giving away your identity by choosing them. Ledger: Independent hardware wallet. If you’re planning on holding large amounts of Bitcoin, you should use Ledger. 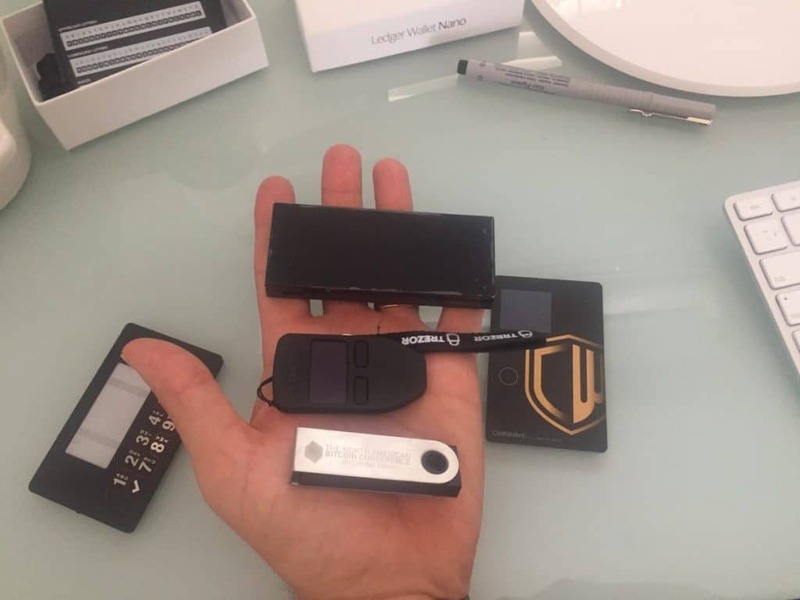 This is a hardware wallet that’s almost as secure as you can get with your coins. Anonymity is completely maintained—the only issue is that since it’s a “physical” product, it will cost you money. However, considering the fact that it protects your investment, it may be worth it. I would go with Ledger if I needed to store a large amount of coins I rarely spent. Blockchain.info: Hybrid wallet (meaning it’s a mix between a third-party and independent). A semi-user-friendly wallet that has a mobile and web interface. Comparing to other third-party wallets, security is high since the company doesn’t have direct access to your bitcoins. Your anonymity is still compromised, but at least you have more control over your coins. Electrum: Independent desktop wallet. In my opinion, if you’re using a desktop, Electrum is the best possible wallet. It may not be super user friendly, but it has all of the features you could ask of a wallet, and it maintains good privacy. Electrum is also open-source and has been around for a long time, so it’s fairly reliable. Alternatively, you can also choose to distribute your coins between several wallets. This way, if something goes wrong, you don’t have all of your eggs in one basket. If you’re reading this guide, my guess is that you’re new to Bitcoin and aren’t planning on buying a large amount of coins to begin with. If that is indeed the case, any of the wallets mentioned above will do the job nicely. Go ahead and choose your wallet: install its app on your mobile phone or create an account through the relevant website. It’s now time to decide on a payment method. 3. When to buy Bitcoins? The problem is that there’s no good answer for this question and it really depends on the reason that you’re buying Bitcoin for. If you’re looking to trade Bitcoins (meaning buy low and sell high) and are in it for the short term gain you’ll probably need to get familiar with different Bitcoin trading techniques and try to time the market (personally I avoid these methods). Buy regardless of the price – Long term believers argue that it doesn’t matter if you buy now or when the price is $100 or even $1000 lower. In the long term the price will go up to make these differences seem unimportant. If you’re just starting out, I suggest going with DCA since it will help you get into the process easier and then decide if you want to change your strategy. 4. How to buy Bitcoin? In this chapter, you will learn the pros and cons of different payment methods when buying bitcoins. It may surprise you, but one of the more crucial deciding factors of how much you’re going to pay for your bitcoins is going to be your payment method, and there’s a good reason for this. Whenever a seller accepts any form of payment that isn’t hard cash for buying bitcoins, he is exposed to the risk of a chargeback. A chargeback basically means that I, as the buyer, can complain to my payment provider (e.g., PayPal, Visa, MasterCard, etc.) claiming that I didn’t receive what I paid for or that something else was not to my liking and I would like a refund. If this happens, the credit card companies may open an investigation, but more often than not, they’ll just go with the buyer’s version. In other words, the payment vendor—e.g., PayPal or the credit card company—would lose money over the deal to maintain its reputation as a secure payment method. Let’s say I want to buy from you a single bitcoin and pay you via my PayPal account. We agree on a price, I pay you, you send me the bitcoin. Now you have my money, and I have your bitcoin. Since PayPal has no way of checking if that’s true or not (since Bitcoin transactions are hard to trace, just like cash), it’s highly likely that PayPal will issue a chargeback and refund me. This way, I get both the BTC and my money back. You (i.e., the seller) will be left with nothing. Because of this, most exchanges won’t allow the purchasing of bitcoins with payment methods that allow chargebacks. However, some exchanges will take this risk upon themselves but for a premium—plus a demand that you verify your identity. These are probably the most common payment method available. These days, many exchanges allow you to purchase bitcoins with a credit card. The main ones are Coinmama, Cex.io, and Bitpanda, with the latter being available in Europe only. Buying bitcoins with a credit card will always require some sort of identity verification and in most cases will cost a premium price. On the other hand, the verification process is just a one-time thing, and the waiting time for your bitcoins will likely be really short. When bitcoins are bought with a wire transfer, once the money goes through to the seller, it cannot be charged back, no matter what. Naturally, many sellers prefer that you pay them using a wire. Exchanges that accept wire transfers, such as Bitstamp and Kraken, will usually sell bitcoins for less than those who accept credit cards. However, the time it takes for the transaction to complete using a wire transfer is significantly longer, as it takes several days for a wire to go through. Some websites, such as LocalBitcoins, connect buyers and sellers who are located nearby in order to conduct face-to-face Bitcoin transactions. Of course, buying bitcoins with cash (or fiat currency, as it is referred to in the Bitcoin ecosystem) are quick and usually cheaper. The downside to conducting transactions with cash is that you have to physically meet with the person. Also, you never know who you are dealing with when it comes to cash, so it’s important to take the appropriate steps to protect yourself (see the bonus chapter for more information). 5. Where to buy Bitcoin? Choosing a Bitcoin exchange is hard work. Each exchange has different rules, accepted payment methods, and fees, along with other factors to take into account. If you want to avoid the hassle, you can use our exchange-finder widget, which matches you up with exchanges based on your location. Countries supported: Not all exchanges accept customers from all around the world. Accepted payment methods: Some exchanges accept a wide variety of payment methods, and some accept only wire transfers. Fees: There are three kinds of fees: deposit fees, transaction fees, and withdrawal fees. Each one is different and can affect the total amount of money you’ll receive in the end. The exchange rate: Some exchanges have low fees, but their exchange rates are higher relative to the competition. This means that the fees are “hiding” in the exchange rate. Buying limits: Your buying limit will depend on your payment method and your identity verification level. If you’re looking to buy a large amount of bitcoins, some exchanges won’t allow it due to their buying limits. Exchange reputation: Is it well known in the community? How well is the support in the event you get lost in the process? Have there been a large number of complaints against the exchange? Keep in mind that no exchange is free of negative reviews, but it’s important to consider the volume and content of those reviews. To help you find the right exchange, we need to make a distinction between brokers, trading platforms, and P2P platforms. Brokers are sites that allow you to buy coins via their platform at a set price, determined by the platform. While being more expensive than other types of exchanges, brokers are the most simple to use and are thus very popular. Simply put, trading platforms connect buyers with sellers indirectly. Sell orders are placed by sellers and picked up by buyers, with no direct communication between the two parties. A small fee is charged by the platform for providing the service. Trading platforms, such as Bitstamp or Kraken to name two, are usually the cheapest way to buy bitcoins, however, they are not the most friendly. For one, order fulfillment is dependent on finding sellers willing to meet your offered price, which might take time. More than that, some platforms offer advanced trading options such as stop losses or limit orders, which might confuse trading newbies. Unlike trading platforms, P2P platforms enable buyers to communicate directly with sellers and vice versa. This direct communication allows the two parties to negotiate over the price. However, this direct communication involves risk, since you are essentially sending money to an anonymous seller. On the upside, P2P platforms usually have benefits such as availability in multiple countries, more payment methods, and the like. Two examples of prominent P2P platforms are Paxful and LocalBitcoins. In conclusion, regardless of the platform you choose, the only thing that matters is that you’re happy with your price and that you’ve found a reliable service to handle your business. As for me, I prefer to pay a little more for a quicker and more reliable service, hassle-free. 6. How many bitcoins do you want to buy? Picked up a wallet? Found your preferred way to buy Bitcoin? Good! You now need to ask yourself a very important question: how much money do you intend to invest in Bitcoin? Bitcoin is a VERY risky asset. This means you should never buy any amount you can’t afford to lose. It’s important to think this through. If this is the first time you’re buying bitcoins, choose an amount that won’t affect you financially if Bitcoin drops to zero. In general, we tend to be overly optimistic when we invest, and we can forget about the very real possibility of a downside. Our personal rule of thumb is to never invest more than 5% of your disposable income or total wealth. Keep in mind that you can always buy less than 1 bitcoin. One bitcoin can be divided up to eight decimal points. This means that you can buy half a bitcoin, one-quarter of a bitcoin, or even one-hundredth of a bitcoin. If you’re looking to buy large amounts of Bitcoin—let’s say over $10,000 worth—there are specific exchanges and brokers that deal in these sort of transactions. If this is the case for you, take a look at this guide. If you’ve gotten this far, then you already know how many bitcoins you’d like to buy and on which exchange. Now it’s time to actually make a trade! The first step is to sign up for the exchange you’ve chosen. During registration, you’ll probably be required to provide some personal details, such as your registered address and ID. In some cases, you might even be required to provide details about your income. Don’t take this personally! This process, known as Know Your Customer (KYC for short), is required by the government and enforced by the exchanges, probably against their will. The good news is that such regulations are the outcome of Bitcoin becoming more mainstream. There’s one very important thing to remember. After completing your registration and buying your coins, I strongly advise you to move them out of the exchange and into your own wallet. In general, any coins you have that are not intended for immediate use should always be kept in your wallet and not anywhere else. Bitcoin ATMs are machines that accept cash, also known as fiat currency, and provide bitcoins in return. Some ATMs allow you to only buy bitcoins, while others will also allow you to sell your bitcoins and get cash in return. Many people love to use ATMs because of the relative anonymity throughout the purchasing process. You don’t have to wait for long identity verification processes to finish. Just enter your money and get your coins instantly. Try to see if you can verify the seller’s identity. Some people will want to remain anonymous, and that’s fine, but verifying someone’s identity will dramatically reduce your risk of being scammed. Try to use some sort of escrow service that will hold your money until the seller sends you the coins. If that’s not possible, stick to cash and meet with the person face to face. In any case, never use irreversible payment methods such as wire transfers before receiving your coins. You’ll want to wait for the Bitcoin transaction to have at least two to three confirmations before considering the deal complete. Of course, this depends on the amount of money you’re exchanging. Smaller amounts can do with only one confirmation. Keep in mind that buying from an individual usually involves a lot of uncertainty, and sometimes it’s just not worth the few bucks you’ll save in the process. I hope you’ve enjoyed this guide! Feel free to ask any questions by contacting me. Also, if you found this guide informative, we’d appreciate you helping us spread the word about 99Bitcoins and sharing it on Facebook or Tweeting about it. I know I already wrote this at least three times throughout this guide, but I can’t emphasize this point enough: If Bitcoin’s history has taught us anything, it’s that as long as you keep your money on an exchange, you don’t actually own that money—the exchange does. If the exchange becomes insolvent or gets hacked, you risk losing that money for good. This has happened in the past with MT.Gox, BTC-e, and Bitfinex. Once the coins are in your account, make sure to withdraw them to the Bitcoin address you’ve copied from your wallet. After the coins arrive safely in your wallet, you can proudly say that you’ve bought your first Bitcoin. Ok , Ive got my bitcoin , I bought it personally paying cash for it. A week later I want to sell them for $ . What now? Wow, this article is just perfect, I couldn’t write better summery and guide line for beginners. It is just make our team glad, that we can find more and more valuable post about this topic.